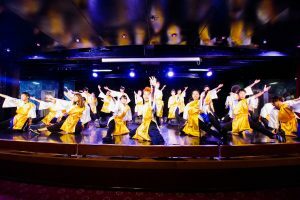 On this voyage, a Yosakoi dance team called “Yorokobi” formed and has been working hard throughout the voyage. Formed by a group of passengers who came together and led by Nakazawa Hiromu, there are around 60 members. Today was the final performance for the Yosakoi team, who put in extra effort to put on an extra special performance. With a loud “Ha!”, the performance began. 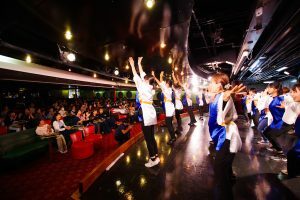 All the outfits, songs, and everything was made by the members of the Yosakoi team, with the aim being to express not only the joy they have found in this voyage but also the endless sea and sky. For all the practice, days spent traveling together, and a heartfelt performance, everything was met with warm applause from the audience. After the final performance finished, calls for an encore began to rise from the audience. 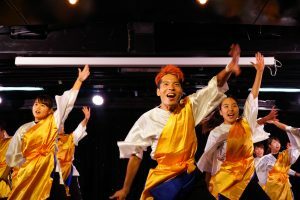 The calls grew and grew and with some surprise, and tears in their eyes, the Yosakoi team took to the stage once more for a truly final performance. Once again they threw themselves into their performance, and then the curtain fell on a final fantastic performance, creating unforgettable memories for everyone there that night.